All our products are made strictly according to existing food processing standards. We make our food on a wooden stove using real fire. Our products do not contain any animal ingredients, preservatives or artificial colouring. Ingredients: eggplant about 60%, ginger, garlic, rapeseed oil, spices. Spicy Eggplant is excellent as a cold starter or as a warm side dish with meat or vegetables, also be spreaded on bread. Ingredients: tomato about 50%, bell pepper, garlic, rapeseed oil, spices. 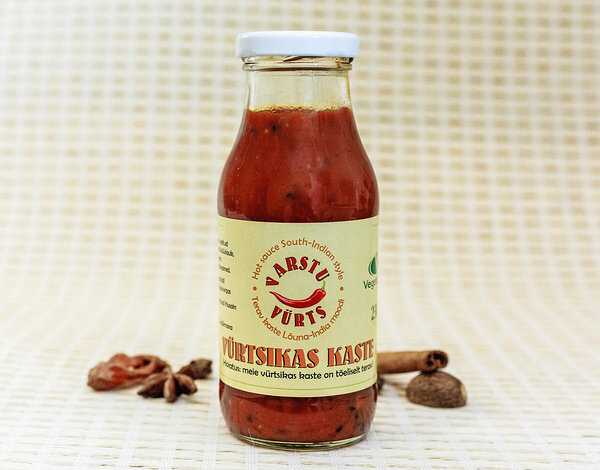 Spicy Tomato is excellent as a cold starter or as a warm side dish with meat or vegetables, also be spreaded on bread. Ingredients: cauliflower about 70%, onion, rapeseed oil, chilli pepper, spices. Spicy Cauliflower is excellent as a cold starter or as a warm side dish with fish, meat or vegetables, also be spreaded on bread. We make our Spicy Cauliflower using genuinely exotic spices. 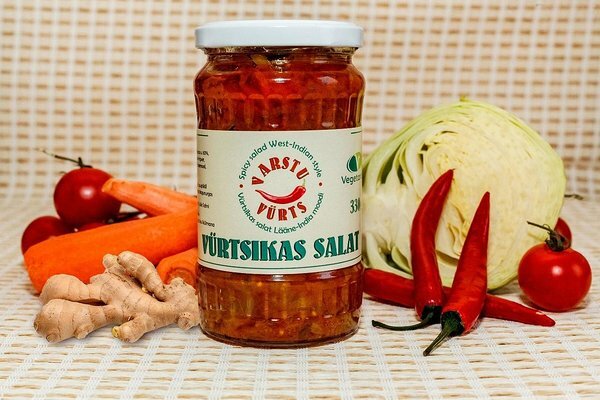 Ingredients: cabbage about 60%, carrot, tomato, ginger, rapeseed oil, chilli pepper, spices. Spicy Salad is excellent as a starter or as a side dish. The special mixture of selected spices makes our Salad rich and very tasty. Hot sauce is our spiciest product.